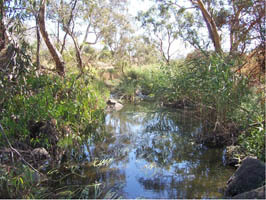 MCMC’s Ecological Restoration Team (formerly called the Parkland Management Team) was established in 1989, and undertakes ecological restoration and revegetation works at more than 80 sites along Merri Creek and its tributaries (and in some cases, adjacent Creeks), from Clifton Hill to Craigieburn. These works are guided by the Merri Creek and Environs Strategy, which sets out the the vision and provides the strategic direction for management needs in the catchment as well as detailing specific actions. 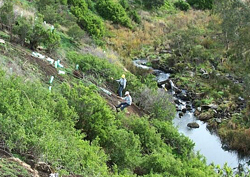 Restoration and revegetation works focus on establishing and maintaining competitive indigenous vegetation through carefully targeted weed control, mulching, planting and direct seeding. 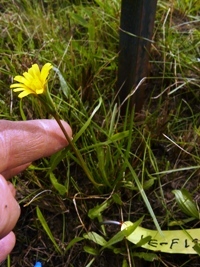 Within the native grasslands, ecological burns are used to maintain the diversity of wildflowers and the health of the Kangaroo Grass. These priorities are heavily influenced by what funding is available. Works are funded by direct grants and contracts from Councils and by a grants from a variety of sources. We also undertake work for agencies and private clients. Merri Creek Management Committee (MCMC) does not own any land, so all its works are done with the approval of the land-owner, often one of MCMC’s member Councils, or Melbourne Water. 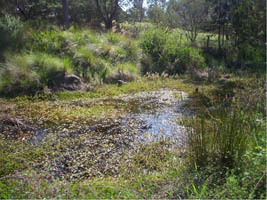 The Ecological Restoration Team works closely with other agencies that also undertake revegetation and restoration works at different sites along the Merri Creek and with agencies that manage utilities and easements within the Creek corridor, including SPI AusNet, CitiPower and Yarra Valley Water. The permanent members of the Ecological Restoration Team are supplemented during the busy planting season with temporary team members. Go to the calendar section of this website to find out about opportunities for community involvement in Ecological Restoration Activities. See the results (3.5MB PDF file) of vegetation management on interface of an urban Grassland Reserve: Ngarri-djarrang in Reservoir. Two projects are designed to have long term impact on the survival of two iconic species in the Merri Creek Valley. 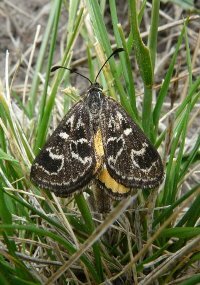 The Critically endangered Golden Sun Moth and the culturally significant Plains Yam Daisy will both benefit from monitoring and on-ground works that you can get involved in. Merri Creek, Preston - once surrounded by majestic trees, diverse aquatic vegetation and a chorus of frog calls. It may have looked like this prior to European settlement. Actual Photo: Merri Creek at Cooper St, Epping. 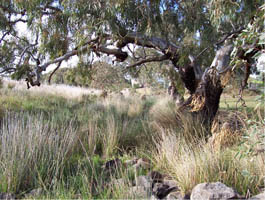 Aitken Creek, Craigieburn - once surrounded by dense tussock grasslands, ancient red gums and teeming with wildlife. It may have looked like this prior to European Settlement. These plantings are helping to restore the dynamic vegetation that fringes the creek, wetlands and tributaries.